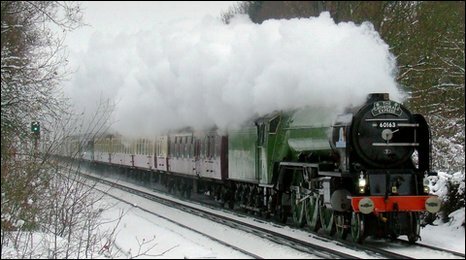 Train services in Kent were hit hard by the freezing conditions at the start of the week. The weather-related disruption included three days of cancellations for Eurostar services through the Channel Tunnel. Tornado, a £3m Peppercorn class A1 Pacific based at the National Railway Museum in York, was in the South East for one day, offering "Christmas meal" trips from London to Dover. Its "Cathedrals Express" service, the last mainline journey in its first year of operations, was about to depart when staff heard about the stranded passengers. About 100 people were offered free seats, according to Mark Allatt, chairman of The A1 Steam Locomotive Trust - the charity which built Tornado. He said: "It was a nice way to finish for Christmas, though I think some of the rescued passengers didn't realise they'd even been travelling on a steam train until they got off." Mr Allatt, who was on the service at the time, said he only saw a handful of other trains between London and Dover throughout Monday. A spokesman for Southeastern Trains congratulated Mr Allatt on his "moment of glory". He said: "I'm sure those passengers were saved from a lengthy wait, all credit to him."